Electronic Cash Ledger is a cash ledger that contains deposits that a taxpayer has made and any GST payments made through cash. The cash ledger segregates the information head wise such as IGST, CGST, SGST/UTGST, and CESS. Each of these major heads (IGST, SGST, etc.) are further divided into 5 minor heads- Tax, Interest, Penalty, Fees, and Others. The Electronic Cash Ledger is maintained on the GST Portal. Here is a step-by-step guide to access the ledger on the GST website. Step 2 – Login to the GST portal with your valid credentials. Step 3 – Click on Services > Ledgers and click on Electronic Cash Ledger tab. 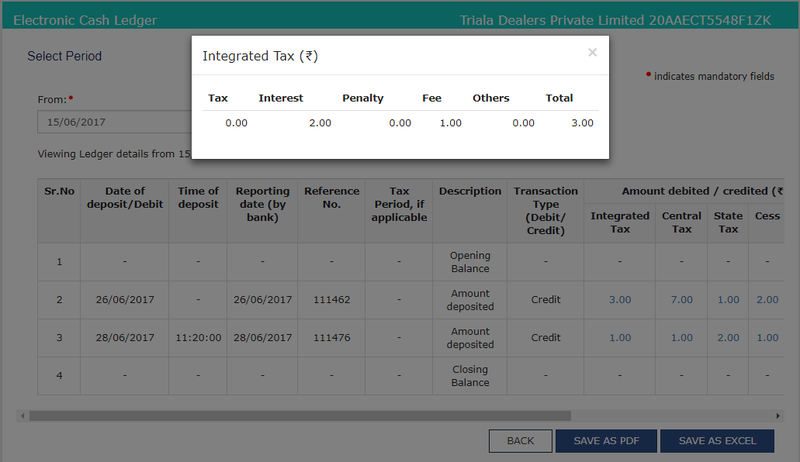 Step 4 – Once the Electronic Cash Ledger page is displayed, Cash Balance as on date will be displayed. 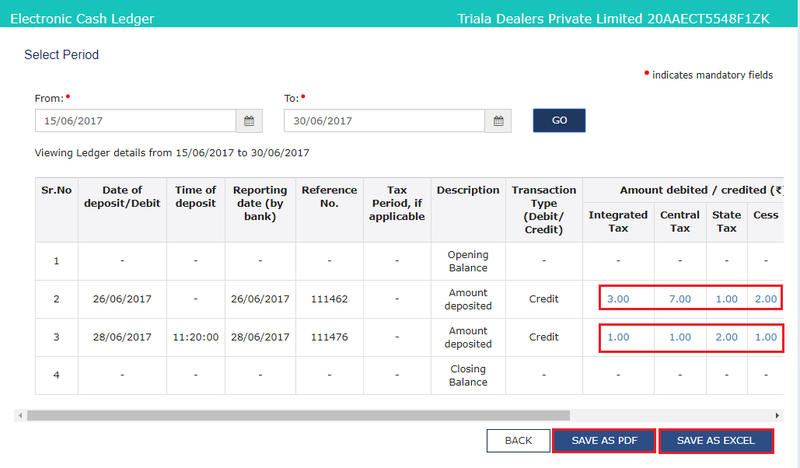 Note: You can click the link to see the amount displayed under Cash Balance as on date to view the summary of the Cash Balance. Step 5 – Click on Electronic Cash Ledger. Step 6 – Select the From and To dates using the calendar to select the period for which you want to view the Electronic Cash Ledger. Click on Go. Note: Please keep in mind that you can view the Electronic Cash Ledger for a maximum period of six months only. Step 8 – You can save it in PDF or Excel format. Click on either SAVE AS PDF or SAVE AS EXCEL button to save your Electronic Cash Ledger in the format you want. Step 9 – Click on the amount displayed under each of the major heads to view the minor ‘heads’ details. When you click on a major ‘head’, say IGST, the corresponding minor head details of IGST will appear.